Tubman was born into slavery in Dorchester County, Maryland. Extensive research now reveals that Harriet Tubman was probably born in late February or early March, 1822, in an area south of Madison called Peter's Neck. Harriet herself claimed she was born sometime between 1820-1825. Born Araminta Ross, she was the fifth of nine children, four boys and five girls, of Ben and Harriet Greene Ross. She rarely lived with her owner, Edward Brodess, but from the age of six was frequently hired out to other masters. She endured inhumane treatment from some masters, including an incident where an overseer who she had prevented from capturing a runaway slave hurled a two-pound weight at her, striking her head. As a result of the severe blow, she suffered intermittent epileptic seizures for the rest of her life. During this period Edward Brodess sold three of Harriet's sisters, Linah, Soph, and Mariah Ritty. When she was a young adult she took the name Harriet, possibly in honor of her mother. Around 1844 she married John Tubman, a free black. He lived in Philadelphia-where Harriet immigrated to when she ran away. Edward Brodess died in early March 1849, leaving behind his wife, Eliza Brodess , and eight children. To pay her dead husband's mounting debts and to save her small farm from seizure, Eliza decided to sell some of the family's slaves. Fearing sale into the Deep South, Tubman took her emancipation into her own hands. Sometime in the fall of 1849 she escaped northward, leaving behind her free husband who did not want to follow. On her way she was assisted by sympathetic Quakers and other members of the Abolitionist movement, both black and white, who were instrumental in maintaining the Underground Railroad. Called "Moses" by those she helped escape on the Underground Railroad, Tubman made many trips to Maryland to help other slaves escape. According to her estimates and those of her close associates, Tubman personally guided more then 300 slaves to freedom in about 19 expeditions. She was never captured and, in her own words, "never lost a passenger." She also provided detailed instructions to many more who found their way to freedom on their own. Her owner, Eliza Brodess, posted a $100 reward for her return, but no one ever knew that it was Harriet Tubman who was responsible for spiriting away so many slaves from her old neighborhood in Maryland. After the American Civil War, it was reported that there had been a $40,000 reward for Tubman's capture; but this was a myth to further dramatize Harriet's greatness in the post-war period. She was successful in bringing away her parents and her four brothers: Ben, Robert, Henry, and Moses, but failed to rescue her beloved sister Rachel, and Rachel's two children, Ben and Angerine. Rachel died in 1859 before Harriet could rescue her. During the American Civil War, in addition to working as a cook and a nurse, she served as a spy for the North. Again she was never captured, and she guided hundreds of people trapped in slavery into Union camps during the Civil War. In 1863, Tubman led a raid at Combahee River Ferry in Colleton County, South Carolina, allowing hundreds of slaves to run to their freedom. This was the first military operation in U.S. history planned and executed by a woman. 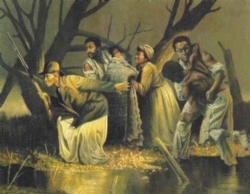 Tubman, in disguise, had visited plantations in advance of the raid and instructed slaves to prepare to run in to the river where Union ships would be waiting for them. Union troops exchanged fire with Confederate troops in this incident; there were casualties on both sides. Tubman's success on the Underground Railroad was partly due to intelligence, cunning, daring, and ruthlessness and in following well developed plans for her expeditions. She relied upon the closely knit black community in Maryland to help her bring away family and friends. She was careful not to meet her charges near their owner's plantations or property, but sent messages so they could meet at another secret location. Tubman was well versed in disguises. She once took the precaution of carrying two chickens with her. When she felt in danger because she recognized a former master, she released the chickens and chased them to recapture them. This amused the master, who never realized the ineffectual chicken chaser was, in fact, a cunning slave stealer. Once at a train station, Tubman found that slave-catchers were watching the trains heading north in hopes of capturing her and her charges. Without hesitation, she had her group board a southbound train, successfully gambling that a retreat into enemy territory would never be anticipated by her pursuers. She later resumed her planned route at a safer location. In addition, Tubman had a strict policy that, while any slave could turn down the risk of going north, anyone who did decide to go north but then wanted to turn back halfway would be shot dead to prevent betrayal of the group and network. Fortunately, Tubman apparently never had to resort to such measures. 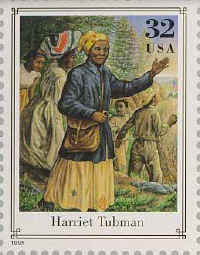 Harriet Tubman was an activist for African-American and women's rights. With Sarah Bradford acting as her biographer and transcribing her stories, she was able to have an exaggerated story of her life published in 1869 as Scenes in the Life of Harriet Tubman. This was of considerable help to her sad financial state - she was not awarded a government pension for her military service until some 30 years after the fact. That same year she married Nelson Davis, another Civil War veteran twenty-two years her junior. They lived together in the home she purchased in Auburn, New York, from her famous friend William H. Seward, secretary of state of the United States of America under President Abraham Lincoln. She was surrounded by family and friends who chose to settle near her after the Civil War. Eventually, due to crippling arthritis and fragile health, Tubman moved into a home for sick and aged African Americans that she had helped found. It was built on land which she had purchased, abutting her own property in Auburn, New York. She told stories of her adventures until her death on March 10, 1913. She was given a full military burial. In her honor, a memorial plaque was placed on the Cayuga County Courthouse in Auburn. Today, Harriet Tubman is honored every March 10, the day of her death.